"> 5 STAR RATING !!! 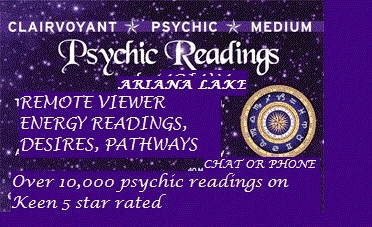 PARANORMAL INVESTIGATIONS.. ENERGY READINGS.. Hello, I am ARIANA A NATURAL ENERGY READER and BORN EMPATH. 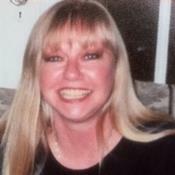 I know first hand how hard it is to go on after the LOSS OF A LOVED ONE, whether it is unexpected or known to come. The grief can be unbearable. I am a soothing healer and a good listener. I do tune in fast and won't waste your time. Perhaps its best to explain that from the beginning of my life my destiny was set as My GIFTS were AWAKENED by a VISITATION FROM AN ANGEL when I was 3 years old, who, at the time of great SORROW, came to COMFORT me. My lessons on earth as a child were hard. My gifts gave me strength to go on as I knew there was more in this World and Beyond. My advice is not meant to take the place of a professional doctor, lawyer or counselor. All information originating from this website is intended for educational, entertainment, and personal interests. Ariana Lake has been a user of Keen since 2007. Getting Otherworld Connections advice from Ariana Lake through www.keen.com is safe, secure and confidential.